The most premier HR event in the world will come to Colombo in 2020. It will bring prestige to the pearl of the Indian Ocean. We have selected a simply significant theme with wide-ranging implications ‘Exalting People Professionals: Explore, Expand and Excel’. Today’s column is a look at the prospects to Sri Lanka in hosting such a premier event, with multi-faceted benefits. Exalting is all about promoting, elevating, acclaiming, or strengthening. In exalting people professionals, what we want to showcase is the lasting value of the most precious resource in any organisation. It is an invitation to all people managers to explore the fascinating facets of human resource management. It in turn will invite them to expand their knowledge, skills and attitudes. In doing so, they will exceed performance expectations in exceling themselves. The main overarching theme was carefully selected also to incorporate global, regional and local best practices. One’s best practice can be someone else’s next practice. The Chartered Institute of Personnel Management (CIPM) Sri Lanka is geared to generate a memorable mega event in showcasing what talented Sri Lankans can offer to the world. The steering committee with CIPM President Dhammika Fernando being the chairman and me, the immediate past president, being the deputy-chairman, are making steady progress in making a lofty dream a lasting reality. It is an opportunity not only for HR managers but all ‘people professionals’ to sharpen their skills and to upgrade themselves with cutting-edge knowledge. In an era where rapid change is the only unchanged reality, the World HR Congress will be an oasis for knowledge-thirsty managers who handle people, deal with people and get work done through people. World HR Congress is initiated by the World Federation of People Management Associations (WFPMA). Reflecting its international origins and concerns, the meeting location moves among its member countries. The World Congress has been held since 1986 in twelve different countries. 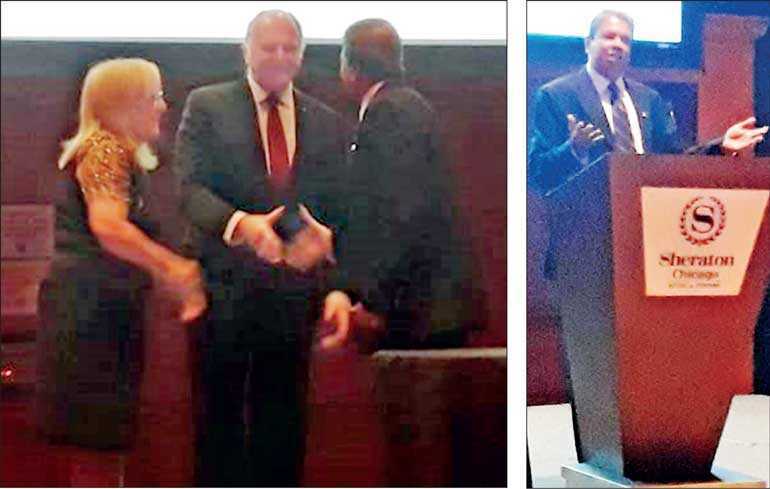 The most recent one was held in Chicago, USA in 2018 and they handed over the organising reigns for CIPM Sri Lanka to host it in 2020. I was so happy to be there as the then president of the CIPM (then IPM) in receiving the hosting rights. The World HR Congress aptly enables managers to build a global community of peers, to discuss new developments in HRM, and to network with colleagues from around the world who face similar complex challenges in HRM. It is a glamorous event in bringing in managers for a refreshing reflection collectively done through a mega event rich in both intellectual and interactive dimensions. In fact, WFPMA is an organisation representing more than 700,000 people management professionals in over 950 national personnel associations around the world. It was founded in 1976 to aid the development and improve the effectiveness of professional people management all over the world. The founding members of WFPMA were European Association for People Management (EAPM), Inter-American Federation of Personnel Administration (FIDAP), Inter-American Federation of Human Resource People Management Associations (FIDAGH) and American Society for Personnel Administration (now SHRM – the US Society for Human Resource Management). Subsequently, the Asia Pacific Federation of Human Resource Management (APFHRM) joined as a full member in June 1980. Further, North American Human Resource Management Association (NAHRMA) was established and admitted as a full member in April 1997. Also, African Human Resources Confederation (AHRC) (formerly African Federation of Human Resources Management Associations), established and admitted as a full member in March 2004. AHRC members are the AFHRMA, and the Federation Africaine des Formateurs et Directeurs du Personnel (AFDIP). Against a background of significant global disruption, change and the quest for competitive advantage, there is a growing awareness of the value of professional human resource management in helping to deliver that vital edge through people. The WFPMA advances its objectives through several frontiers. The premier among all is the World Congress held once in two years. Research on critical and emerging HR issues that have a positive impact on business is another front. Recognising outstanding world HR leaders through the WFPMA Petitpas Award is another initiative. Convening twice-yearly Board meetings and specialist working groups, facilitating networks among member countries, federations and external bodies, promoting the use of a website for the dissemination of relevant information are also significant aspects of WFPMA. They have a WorldLink newsletter published five times a year. The APFHRM is the network of human resources and people management associations' representative countries in the Asia Pacific region. It is duly affiliated to WFPMA. The Institute of Personnel Management (IPM) Sri Lanka is a vibrant member of APFHRM. The APFHRM collectively intends to advance the standing of the HR and people management profession within the region. It does this through its member representatives regularly meeting to exchange knowledge and research on best practice in HR. From the member associations' geographical proximity to one another, the Federation's major focus is in matters relating specifically to HR in the Asia Pacific region. The countries that form the federation are Australia, Bangladesh, Fiji, Hong Kong, India, Japan, Maldives, Malaysia, New Zealand, Pakistan, Papua New Guinea, Philippines, Singapore, Sri Lanka, Taiwan, Thailand and Vietnam. With the active participation of these country HR organisations, APFHRM aims to serve as the umbrella organisation of all human resources institutes within the Asia Pacific Region. It also aims at improving the quality and effectiveness of professional human resource management in the region. Further, it encourages and supports human resource professionals in creating and developing their own associations in Asia Pacific countries where they do not yet exist. Also, APFHRM provides guidance and assistance to all member countries especially with regards to their programs that will uplift the human resource management profession. The APFHRM strives to create a network of communities of practices in the region. It encourages national HR associations to identify research and report on invaluable lessons and stories of human capital management practices that will impact personal, organisational and business effectiveness through the creation of values by different groups of human capitals. CIPM Sri Lanka has been the PRESIDENT of APFHRM in the past and currently occupies a Vice- President role. Based on the rotational nature of hosting, APFHRM will get the opportunity to host the World HR Congress in 2020. This is after the WFPMA World Congress 2018 held in conjunction with the Society for Human Resource Management (SHRM) Annual Conference and Exposition in Chicago, IL, USA on 17-20 June 2018. Reflecting its international origins and concerns, the event ‘moves’ around the world. The World Congress has been held since 1986 in the following cities. 2018 Chicago, USA, 2016 Istanbul, Turkey, 2014 Santiago, Chile, 2012 Melbourne, Australia, 2010 Montreal, Canada, 2008 London, UK, 2006 Singapore, 2004 Rio de Janeiro, Brazil, 2002 Mexico City, Mexico, 2000 Paris, France, 1998 Caracas, Venezuela, 1996 Hong Kong, 1994 San Francisco, USA, 1992 Madrid, Spain, 1990 Buenos Aires, Argentina, 1988 Sydney, Australia, 1986 Washington DC, USA. We can clearly see that it has been held twice in Australia that covers Pacific region. It was also held in Hong Kong and Singapore that covers the East Asian region. What has not yet covered in the Asia Pacific region is South Asia, which houses one-fifth of the world population. That was our competitive advantage. Myself, together with Dhammika Fernando and my predecessor at IPM Rohitha Amarapala, outbid Australia, Thailand and Philippines in winning the hosting rights through very competitive process in Hong Kong in 2017 November. Now the ball is in our court. We need to do justice for the Asia Pacific Region in not only showing the organisational capabilities of CIPM Sri Lanka but also showcasing Sri Lanka as the ‘Wonder of Asia’. It will be a collaborative effort of CIPM and other professional bodies representing multiple fronts. The Postgraduate Institute of Management (PIM), being the nation’s ‘management mentor’ will be a partner for this endeavour. Sri Lanka Tourism Development Authority (SLTDA) and Sri Lanka Institute of Tourism and Hospitality Management (SLITHM) also have already expressed their willingness to collaborate. 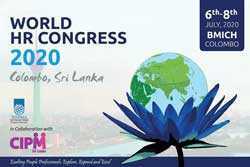 The World HR Congress will show the world the potential of post-war Sri Lanka with its multiple investment offerings. Also, being the knowledge-hub of South Asia with a very high literacy rate and other Human Development Indicators (HDIs), Sri Lanka can make an impactful impression among the global and regional participants of the event. Opportunities for knowledge sharing, research collaborating and professional networking will be in abundance. As Walt Disney said: “If you can dream it, you can do it.” This is what keeps us going. As the logo of the event depicts, the national flower holds the globe, significantly depicting the island nation of Sri Lanka. Despite the bumpy rides we often see in the political circles, our motherland has many things to be proud of. Surely, we will make the World HR Congress 2020 such a meaningful and memorable event. This is how we exalt people professionals in inviting them to explore, expand and excel.